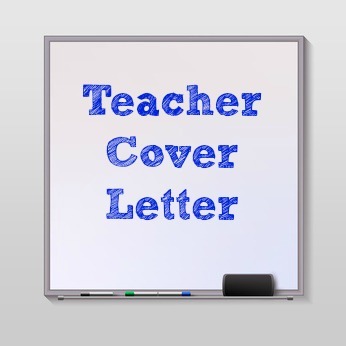 Customize the teacher cover letter for your own use. This cover letter can be sent with your resume in response to a specific teaching job opening. Adapt the letter according to the requirements of the teaching job you are applying for. Highlight your teaching strengths and areas of expertise as they relate to the needs of the district. Focus on the reasons why you are a good and enthusiastic candidate for the teaching job opportunity. Motivate the employer to take your application to the next level of the hiring process. I read about the Elementary Teacher position advertised on Teachers.com with great interest as my qualifications and experience closely match your requirements. Therefore, please accept my resume for your review and consideration and allow me to briefly explain how I can contribute to your district. Since graduating eight years ago with a Bachelor of Arts degree with a specialization in both early childhood and elementary education I have worked in a variety of educational settings. I have developed many valuable skills while teaching diverse groups of students including both children with learning disabilities and gifted children. I am adept at individualizing the curriculum to meet each child's different needs and designing resourceful lesson plans that accommodate differing learning abilities and interests. I enjoy being creative and utilizing new ideas and approaches to improve the learning environment for my students. I have incorporated a variety of hands on activities, fun manipulatives and learning projects to inspire and motivate the students. This also includes the innovative integration of technology across the curriculum. I am passionate about empowering elementary school children and helping them to develop their full potential. Part of this process includes close interaction with parents to encourage participation and reinforce learning in the home while building the child's self esteem and confidence. I am well aware of the high standards of your district and it would be a wonderful challenge for me to be part of your school staff. I look forward to discussing this opportunity with you at your earliest convenience. Please feel free to contact me via phone or e-mail. Your teacher cover letter should clearly demonstrate your enthusiasm for teaching and your ability to communicate. Highlight a couple of key strengths that make you the right job candidate. Use this guide to find out your strengths. Clearly present your areas of expertise and come across as a professional and committed teaching job candidate. Include why you are interested in that particular age group and that specific school district. Use clear and direct language and carefully proofread your letter. 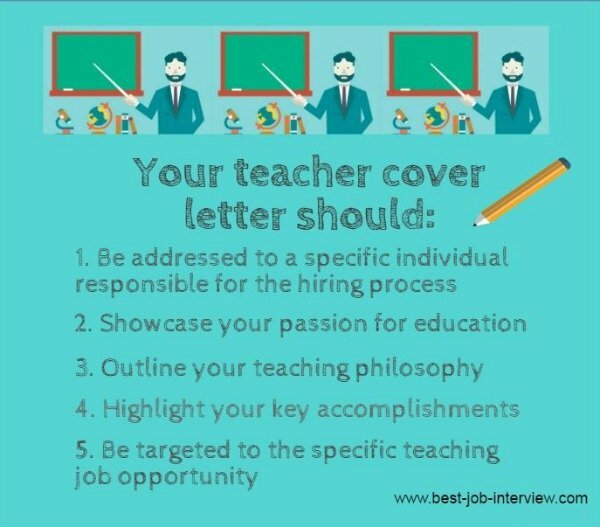 Helpful teacher cover letter tips. This comprehensive teacher job description provides further help for developing your cover letter and resume. The kindergarten teacher job description can be used for teachers in the kindergarten phase. The detailed job description for a special education teacher is another useful resource. 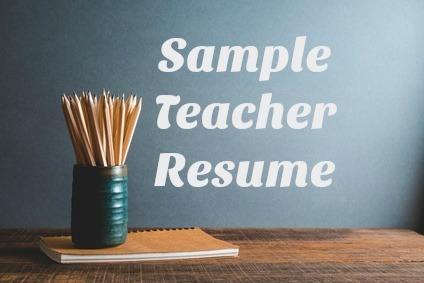 It is important to make sure your teacher portfolio is current and ready for presentation when you are involved in a job search. Be well prepared for your teacher job interview. View the interview as an opportunity to set yourself apart from the competition. Go through these sample teacher interview questions and answers and be ready to confidently handle your interview. If you are going for a special education teacher job interview, use these sample special education interview questions to prepare. Find excellent teaching job resources to help you in your job search.